""The most features for the lowest price""
"The most features for the lowest price" is what written on the Elastic Email homepage and... it surprisingly delivers. With minimum setup, efforts and resources, Elastic Email allows you to set up an email marketing campaign from the grounds-up. You can do literally everything necessary in Elastic Email for this purpose: Create new templates (and export them into other services if you like), manage subscription lists (even though we use Emailmeform for this, it's nice to have an alternative) and to monitor the campaign results. Elastic Email is a simple and straightforward tool which encompasses how a mass mailing solution should look and feel. There's little me and my team doesn't like on Elastic Email. For the price, it's little to complain. If I had to pick one thing, that would probably be how Elastic Email handles version control. Not the most glaring issues, but you have to manually restore the latest template version when you leave the app. This is something MailChimp does better, i,e. automatically. If you're considering to go with Mailchimp for the emails campaigns, give Elastic Email a shot first. Some may find it a lot simpler and no less effective. Elastic Email allows me and my team to send hundreds of personalized email newsletters, hand-crafted with beautiful layouts and images. It's fast, light and simple and, what's most important, it does the job and delivers emails with zero issues for us or the recipients. "Tried it and loved it"
Elastic email turned out to be a mass mailing solution on par with the industry giants alike Mailchimp. It features a comprehensive HTML newsletter builder alongside a quite comfortable list management engine. What I especially like about elastic is email tracking capabilities which result in detailed analytics on every campaign we send. The tool is really decent and worth its money. HTML builder acts quite weird sometimes. What I mean is how the system handles versioning and progress saving. When you return to a newsletter you've been building, Elastic won't always open the latest version of this email and you'll have to look for an actual version somewhere in the history of updates. I've only recently heard about Elastic Email and gave it a try. It turned out great and you also might find it suitable to your needs. We're using Elastic email to manage our clients lists for mass mail as well as perform such mass mail. It does this job great. "Impressive service for a such low price "
I used Mailjet for the last 6 months but I wasn't that happy with the service. I just need a simple tool to send my email newsletters. I was a bit afraid to test another emailing service but I saw some good reviews for ElasticEmail. The signup and the upload of my database were very easy. Then it took me some time some to understand how to validate my domain with the DNS settings. Once it was set up, I came into some sending rate problem. I understand that a team member should validate my account first but it was not clear what I needed to do and how it is done. So I contacted the support. I was afraid to have to wait for a couple of days but they replied so quickly and they fixed the problem in no time, it was hard to believe, I'm impressed! They saved my New Year's Eve campaign :). A big thanks! "Easiest and Cheapest Email Marketing Platform"
We are using Elasticemail from last one year and we are fully satisfied with this platform. Elasticemail is easy to use platform, any nerd who is new into email marketing can use this easily without any external support. The feature are not so vast as compared to other tools but the available features are sufficient to use for minimal requirements. The feature includes segmentation,reporting analytics and proper list management. It is also very cheap as compared with other platform & reduces our cost of email marketing. The SMTP integration of the elasticemail is also very easy and can integrate easily with our CRM or other front-end tools. Sometimes there are errors in the frontend & the delivery of mails also get slows down. If your requirement with email marketing is very minimal and you only concern with the sending and tracking of emails, without using any advance email marketing feature. Then elasticemail is surely the solution! With Elasticemail, we are using it for sending our promotional mails and also use its SMTP integration with our CRM. Both are working well at our end. "The most features for the lowest price!" I was searching for a good solution to send a daily newsletter to a few thousand subscribers. I was hoping to find something that wasn't much more expensive than Amazon's Simple Email Service (SES). To my surprise, I found Elastic Email, which has significantly more features than SES and costs less! The customer support has been well above average, responding swiftly and accurately, even on weekends and at odd hours! They have tools to help audit and monitor your content to help you send something that will fly through most spam filters. Some of the documentation was lacking, but overall setup was quite easy. The requirement to have a physical address in each email makes sense but seems a bit over-the-top. Although this is a very low percentage, I've had ~0.5% of my daily emails bounce due to the sending IPs having a bad reputation. I understand that you can purchase an IP for an additional (somewhat high) cost, but this should not be necessary. The default IPs are obviously shared between customers, so if someone else is sending a lot of spam, it can negatively affect you. It allows me to send emails in bulk at a very low cost. "Very cost effective solution with free 150,000 emails per month"
As I am new into email marketing, I was looking for affordable and good solution, but what I found is great. Elastic mail is great in terms of setup, features, templates (both drag & drop feature can be used with raw html editor), reporting tools, A/B testing, Dynamic IP at a very reasonable rate, free 5000/daily emails (which is great for start ups), and after free mail it's just 0.09$ per thousand mail, it's just so much affordable with lots of great features. In elasic mail you will get a lot of API to integrate with your systems and open sources. You can allot sub accounts to your colleagues, customers, friends to manage it. If you'll not send good emails, your reputation will lose and it's a perfect thing that other spammy users couldn't impact your marketing. In one line, it's the best tool for email marketing. Go for it. Domain / SPF / DKIM setup is little bit pain, it should have a clear and easy documentation. WordPress integration is little tuff, email bouncing detailed report need some improvement. I tried to upload duplicate contacts with more information, I couldn't do it. It needs to improve, other than these I find everything is perfect. If you're a new user, start ups, or you want to send big campaigns Elastic mail is for everyone at a very affordable price with great features. Just go for it and you'll love it. I use Elastic mail for my email marketing, newsletter campaigns. It works great, you can use HTML form given, can set premade templates, can set differnt-2 templates for each campaign. I use it and I get great results. We use it for affiliate marketing as well, we used it free version of 5000/daily emails and started earning it without spending a single penny. We also use it for our clients, who don't have much budget for email marketing, it's perfect solution for them. Sub-account section is great. "It works like a charm, super easy to setup!" I was comparing other email services before using it (Amazon, Mailgun, Mailchimp, Sendgrid, AWeber) and for me it was the most grateful experience. Very easy to setup, grab the api keys and use it into my CRM. You can also check if everything is going well in the user panel. You can check if your domain has correctly installed SPF and DKIM records. It will help you to reach the inbox and avoid your emails go to spam folder. Elastic Email also offers the biggest quantity of email sent per month, so I can grow up my business with them while making it profitable without worrying about a this limit. When I need more emails I will pay for 1000 additional email $0.09, which it's a really good price. Totally recommended if you want to start with transactional or email marketing and you have between 2.000 and 10.000 subscribers/members. You should try it, it's free and easy to setup. Elastic Mail makes sending my mail out very easy and affordable. They make it easy to step through the sometimes complicated process of setting up SPF and DKIM records. I've been sending all of my mail via Elastic Email for years and hope to keep doing business with them in the future. Their support is also really pleasant and accessible. On the few occasions I've had to engage with them they've resolved my issues in short order. I'm not happy that they require me to place an unsubscribe link on all email, even personal email. I wish they'd limit that to large mass mailings. I understand their desire to keep off of spam lists, but they should do a better job making a distinction between low volume, or one-off personal mail and mass mailings. My residential ISP doesn't permit me to send outbound emails directly. Elastic Email allows me to relay my mail without my restrictive ISP from bothering me about it. What's better, they do so at a very comfortably affordable price! What's better, instead of just sending my email off into the ether, I get a near real-time review report on where it's gone and whether it's bounced, why it's bounced, or if it's been delivered. "Easy, affordable, functional and fully supported"
Easy to use and edit templates. You can easily use both Drag&Drop and Raw HTML editor. Elastic Email recently use new design and new control panel that is very user friendly. Also new plan of pricing that is wonderful especially for small businesses. In Elastic-Email you can find lots of API that provide you any information or details you need. Sub-accounts help you to manage your colleagues our even your sub-customer. You may easily lose you Reputation here and its a perfect things that other users couldn't impact your marketing. In short I can say, You can find everything is the best here. Litmus tests charged for 1$ and I think it was better if this could be free. When I want to import some contacts I couldn't import duplicated contacts. There is an option that doesn't disabled. Sometimes I want to import duplicated contacts with other / updated information and its make some difficulty. We have our self email servers but its make some problem for us and lots of our email got spammed or bounced or not delivered. In other hand some email providers charged more prices than Elastic Email. As well the best feature with easy to use encouraging us to use Elastic Email. We use Elastic Email to send automation emails and Email Marketing. "The pay-as-you-go service offered coupled with their free 150,000 emails per month are mind blowing." What I really liked about Elastic Email are mainly their Unique landing pages, good looking forms, well-layed data analytic and implementation codes in more than four major programming languages. With their Video tutorials you do not need any other email marketing training-they've got your back! Also, the free monthly 150,000 free emails for anyone is also good for me. Elastic Email is one of the best email service provider out there, everything you needed for your email campaign is on their portal, so, they are perfect! Elastic Email is one of the best email service provider out there, everything you needed for your email campaign is on their portal. Talk of Unique landing pages, well-layed data analytic, SMPT and HTTP API, Campaign Automation and implementation of codes in more than four major programming languages. With their Video tutorials you do not need any other email marketing training--they've got your back! I advice you try them out today and you will not regret it. Bulk emails to my subscribers using their SMPT API with the free 150,000 emails per month. Before deciding on Elastic Email, I have tried several transnational email providers with, let's say, ridiculous pricing models, reaching the price of regular mail. The other option was also Amazon SES server with much more complex configuration than regular provider's. And then, through Google search I found Elastic Email, with acceptable pricing model, that was also very easy to use, required only several DNS configurations. At our own backend, setup was also easy and old fashioned - simple login to Elastic Email's SMTP server. Elastic Email also has an API, so more complex solutions can be deployed than just that. I have enabled this service for all of the existing projects and still using them. Now, for 8+ months I have reliable and easy to use email service platform for all of our current and future projects. Over this time period had nothing to solve and had no need to even contact Elastic Email support. Dislike tracking URLs that use redirects, which in the case of TLS, often go nowhere. Email template can be more flexible. When setting Elastic Email for the first time, it was pretty hard to find DMARC, etc. DNS settings, it can be probably improved with some popup near domains setup. By using Elastic Email we have saved a lot of time instead of setting up and configuring our own server on Amazon SES, not including, Elastic Email has much better pricing model than Amazon. "The Best of Email Delivery System"
If You are looking for Email Campaigns with Good pricing & great Features in Form of Delivery, Reports , Templates.. Here my Search ends on Elastic Email. Reporting section is the most I loved it, Even I can see Dynamic mails whats is being sent to final user. The Pricing is even affordable to small business owners like start ups. Firstly I was little worried about pricing and all but when its starts sending emails your pricing per thousand email goes down which is most interesting.. Thanks once Again Elastic Email!!! There may be something but Need to explore it.. Till now not a problem..
"Highly Recommended For New Entrepreneur and Digital Marketers!" As a new Entrepreneur and Digital Marketer, I have to learn and read reviews from a lot of email marketing services. Elastic Email gives me chance with many necessary features for email marketing, I even don't have to spend a single penny to figure out which works and which not. The price for IPs is reasonable. I will recommend Elastic Email to my friends. If you've just started up your new business and you have to do many things in your own, you should use this email marketing service. Or if you are new to email marketing, try yourself with Elastic Email and you will learn a lot. Elastic Email helps me cut costs. It is very important for my new start up. Moreover, by the documentation of the service, I learn a lot about email marketing. Our company has been looking for a MailChimp alternative for quite some time. It's near impossible to compete with the market leader, but Elastic email is on the right track. It has almost everything needed for sending a mass mail campaign with email traking and analytics to compare the results of campaigns with one another. Plus, the html newsletter builder is really capable and you can export it with no issues. Auto-saving feature for the newsletter tempalet builder is somewhat finniky. It works, but you always have to go look for the lastest version instead of elastic loading it up automatically. A worthy MailChimp alternative. Give it a try! Sending newsletters to our subscribers. I had an issue that was NOT a quick & easy fix. After my issue was escalated to a rep named Andrzej, he spent the better part of 2 weeks troubleshooting and implementing different solutions until my issue was finally solved. I don't have a single negative thing to say about Elastic Email at this point. Plain and simply, Elastic Email gets the job done. We are a digital marketing agency that provides web hosting along with a multitude of other services. Because we host websites, we needed a reliable SMTP provider. Elastic Email delivers (no pun intended). "Affordable and easy to use, but ran into several issues as we scaled up." There are a lot of things to like about Elastic E-mail. Very affordable. You get 150,000 e-mails a month for free. We currently send 300,000+ e-mails a month, and it only comes out to around $100. We're growing quickly, so the flexibility of their pricing helps. Interface is very simple and easy to use. When it's working properly, it's working great! Customer service is fairly responsive. I think they are heading in the right direction. As far as I know, with larger companies like SendGrid, they sometimes completely ignore issues and will let bugs fester in your system. I haven't had this issue with Elastic E-mail, so I've stuck with them. I also haven't used any other e-mail platform, so I honestly don't know if everyone runs into problems like the ones I have in the past, so I'm kind of at a crossroads where I don't know if I should ride it out, or look to switch. 1. For the past year they have been going through many updates. Several times during this process, our e-mails just stopped sending, and we weren't alerted about it until I noticed the drop. For this past month, their graphs have not been working and I've been unable to track our open rates. As a result, we had to freeze our marketing budget and wait for them to fix it. It's been more than a month, but no progress so far. I have been told the problem has been resolved several times, and then when I went back to check, there was no difference. I've pretty much just been going around in circles with this problem. 2. Customer service is decent, but with notable limitations. First, only a few of their employees are truly responsive (Joshua, Andrzej, Beverly are all amazing!). Rest will try and give you canned responses for hours and hours, or they won't read your query at all and answer a completely unrelated question. I had to go back and forth for weeks sometimes until someone finally admitted there was an issue with something. I recommend specifically asking for certain representatives when you run into trouble. You'll know pretty quickly which ones are good. And second, it's not really 24/7 or as fast as they make it out to be. They respond "within the hour" but it's only with "Thanks for your e-mail, we're looking into this." Usually takes 1-2 days for small issues, and sometimes a week or more for bigger ones to be resolved. 3. We've run into a lot of problems as we've gotten bigger. We started on Elastic e-mail sending only ~5,000 e-mails a month. Now we're sending 300,000+ and there's a lot of issues with our logs being read incorrectly, throttling, deliverability problems, etc. We're considering switching to Mailgun as we scale even faster going forward, but still uncertain about it. Other startups that I know usually just set their e-mail systems and don't have to worry about it. I've had to pour in hours and hours into Elastic E-mail, trouble shooting through logs, making screenshots for their customer service team, etc. I'm hoping the issues get resolved eventually, I'll come back here and update the review if it does. Until then, I'd say Elastic E-mail is a 3/5. Overall, I am fairly happy with them. I will say - by far the most annoying thing they sometimes do is pretend there is no issue when there is, and you have to go a very far length until they admit it and try and fix something. This isn't just prevalent on their support side, they even do it on review forums, where they try and disregard what previous customers have pointed out. It's EXTREMELY frustrating with companies do this. It's like when Comcast tells you "no, no, your cable is working fine," and you have to video yourself trying to turn your TV on to prove otherwise. If you expect the number of e-mails that you send out to grow quickly, DON'T put too much weight on cost. Yes, when we started out, EE seemed like the best way to go because something like Mailgun was so much more expensive, but once you scale, the cost ends up being a small fraction of your revenue anyway, and you'll wish you went with your best option instead of the most affordable one. We help readers around the world find free and bargain books online. We've been using elastic for transactional emails for the last five years. The system works fine and was easy to integrate with our back-end software. We've sent hundreds of thousands of emails through their service in that time. Our account was suspended recently and elastic doesn't even send us a notification that that is happening. There is no communication from them about the fact that our email has stopped sending. Critical issues like this should be handled proactively. Rathe than being able to address an issue when it happens I'm instead left to put out a fire when we get complaints from our users. Since we last evaluated the market some of the big cloud players like Amazon have gotten into the market and might be better choices now. We were using them to help ensure deliverability of transactional emails. We are sorry to hear about this. I have checked and our records indicate that in early 2016 you opted out of receiving our transactional emails by marking our emails as Spam/Junk in your email client. So, when the sub account was placed Under Review for a high rate of complaints - there was no way to get in touch. I can see several notification emails that were queued up to send, but were suppressed because of your email address's status. As a courtesy I have already reactivated your sub account that was placed Under Review regardless of the complaint rate, as I can see it is generally lower volume transactional email. Please reach out if you wish to reactivate your account email address status with us so you may start receiving transactional emails from Elastic Email again. "Great experience with Elastic Mail"
Elastic Mail has made sending all the above quite easy once I got the hang of it . The support system that Elastic Mail uses is the best I have ever encountered. Each person that replied to me was super fast in their replies, knowledgeable, interested in my success and was as patient and courteous as it can get. I am actually thrilled with their support team , no other company has come close to the quality they provide. to eliminate spam. I had ALL opt ins and yet my first few campaigns got bounced like crazy. 550'ed until I was able to get help from the support team. things , but wish I hadn't had to go through all that to get my delivery up to par. once set up with the help of Elastics support as well as a private IP , I am thrilled with what I have now. from a high delivery rate and the tracking / reports that are provided. "Elastic Email the most flexible & transparent email sending service"
I'm quite an expert when it comes to sending emails in large quantities, i've used many different systems and i've never seen anything like Elastic Email. I've used Mandrill, Sparkpost, Sendinblue, Pepipost, etc, but elastic emails is the most advanced & most reliable system i've ever used, the pricing methods are very competitive as well. You might find it a basic product if you only judge by the interface (which i think is the only weak point) however there is a beast lying under this basic interface, if you search for something or you try to see the email logs, which in my case are many millions, you are going to be shocked by the speed of pages, this is one of the things that i love about Elastic Email. The API is also very flexible & easy to use and there is nothing you can't do with the API. The support is also super awesome & super friendly, i don't know if they have a strategy to say yes to any kind of request or this is because of the flexibility of the service that they can do anything you ask them! The sub accounts system is very helpful as well, for example when i'm sending a newsletter to all my users and there are thousands of emails in the sending queue i don't want my welcome emails or forgot password emails get stuck in this queue, so i use a sub account (with a different ip pool) for sending these urgent emails so that they don't get stuck in the queue. Most email services can't do such a thing and some of them try to solve these kind of problems by prioritizing some emails but we all know that they don't always work. The interface is primitive compared to the flexibility of the system lying under it, i know that there has been modifications that fixed few problems but there is still room for improvement, also doing some stuff isn't that easy for example if i want to see the email logs, first i have to open the reports page to be able to go to logs page, so some UX improvement could be useful. The documentation was a mess last year but it has been organized now, but there is still room for improvement in advanced topics like unsubscription. The pricing is very competitive, the service is pretty stable and reliable and the support is very helpful. "Best and easiest way to get more leads and reach customers"
Ease of use. Elastic mail is great, specially if you're a new into email marketing. You can start sending transactional email, marketing email within few minutes and that too at very cheap cost. It's one of the best email marketing programs in the market, so elastic mail has tons of features from templates, A/B testing, Social marketing share, reports, dedicated IP and there are lots of online help as well to learn if you want to learn instantly. Process is straight forward and you get lots of features without spending a single penny. Elastic mail is a nice tool to use to manage just about everything you need. WordPress implementation, detailed reporting on email bouncing and a little more easy documentation for Domain / SPF / DKIM setup. We clearly recommend Elastic mail, if you are a small business and want to start email marketing, go for it, give it a try and apperciate it. Elastic mail is very easy to use, UI is very good and easy to use, clicks and spamming is great. Best part is, it's very cheap to their competitors. We have the clients and organisation having low budget for email marketing. For them it is perfect solution and the free package is an great choice than the competitors. You can create any number of email templates you want, different for each newsletter. Payment system is automatic , so accounts get renewed automatically without any effort. They have the very good tool of sub-accounts, I can give access to anyone in my team, to my friends etc. It was easy to setup a campaign and add/edit email templates. Vague price information. It says 150000 emails are free (per month). I've added 100000 for a campaign but have to pay $0.09/1000 emails, no matter they should be free. Also, it's unclear should I pay and how much exactly the fee for "Contact delivery and optimization tools". By default they are pre-selected so it's unclear after all. After ~10k sent emails my account was blocked due to low open rate...I didn't know you are obligated to have a specific open rate. Sometimes people from the list simply are not interested in the topic/mail subject. How am I supposed to be punished for that?! Check their prices first and be sure you understand their model. I want to send emails to my newsletter subscribers. "Solid for what you need." They have upgraded the interface quite a bit. 150,000 free emails per month upfront is more than what most people need and I've never had issues with emails being sent or delivered when its all setup correctly. Lack of overall integrations. E.g. WordPress connection is weak but there is an old plugin that still works really well. MailJet has a bit better integration but MailJet has a lot more account setup information required. Really evaluate if your website or CMS platform has the integrations to use the ElasticEmail API and make sure it works before deep diving in too far. What I've used this product for the most is on client websites. A lot of web hosts like Godaddy and Bluehost, etc. Have WordPress style websites that tend to spam or have emails that look like spam. Those servers then get Blacklisted and when you have shared hosting - All of the websites on that 1 server get blacklisted for sending email. This creates huge deliverability problems. Elastic Email fixes this problem by allowing me to add domains and verify for each client and allows me to have 1 account that runs all of the clients emails with solid deliverability. "Amplia capacidad de correos por mes"
Lo mejor sin duda es la capacidad de envío que incluyen las cuentas gratuitas. Muy fácil crear plantillas, puedes separarlo de tu hosting para hacer envíos enormes en menos tiempo sin afectar tu hosting. Con el editor de plantillas puedes crear correos muy profesionales, atractivos para los envios masivos. Lo uso con un plugin de otra aplicación y aveces manda error, teniendo configurado todo lo necesario. Debería tener una mejor herramienta de limpieza de la base de datos de correos que uno envía. Para probar un mayor alcance de correos a un costo más bajo, se los recomiendo. Es muy completa las opciones del usuario que lo administra. El poder hacer envíos masivos a más de 2,000 contactos y en menos tiempo. Aunque el manejo se haga directamente desde este aplicativo, no siempre es recomendable sobrepasar el limite de envío que tiene permitido el hosting provider. Para el seguimiento de lo que hacen los usuarios al recibir boletines informativos o promocionales, es muy útil. "Best API and fancy email templates"
I have been using transactional email for pretty long time for our business. After trying Elastic Email I was amazed by their API engine. It is fast, it has easy way to include email header parameters. Most remarkable feature is their builtin HTML email templates for marketing and transactional use. Those are beautiful and easy to customize. Everything else is likable with Elastic Email, something I didn't like is their Report graph, it takes time to load. For startup and easy maintenance Elastic Email will be a great choice. We are using Elastic Email for our transactional emails and somewhat marketing emails. It is easy to manage contact list there and track activities of contacts. "Elastic Email is reliable! " Transaction email via smtp and api and delivery to inbox. We have been using Elastic Email for over 3 years, it has been a reliable experience and the customer support is amazing. I recommend elastic email for transactional and marketing emails. I have not really had a bad experience while using Elastic Email. We use Elastic Email for transactional email and it has been working well. We have assurance that our emails always arrive inbox of our subscribers. "Easy to use send & track"
Elasticemail is something in which anyone can easily create, send and track email campaign. You dont need to be an expert to use elasticemail. Just signup and send your emails. Elasticemail is also having a very cheap pricing with good delivery. Some of the times the frontend doesnt respont and behave improperly but it occurs very few times. If you want to send emials in large volume at a very minimal price then you have to surely move to elasticemail. Go For It! "Great cost effective Alternative for large lists and irregular campaign sending"
Elastic Mail seems to be one of the only online bulk email programs that don't seem to be concerened with how many subscribers you have, which is great if you have many to start with and don't want to spend an arm and a leg for sending out irregular campaigns to your large subscriber list! Infact the cost in comparison to the other options out there is almost too good to be true! The setup is quite involved, especially setting up the server side settings for your domains if you are not familiar with that side of things it can be a bit daunting. I would definately recommend Elastic mail if you are looking for a cost effective email marketing solution that has an easy to use wisiwig email composer and with a hundred and fifty thousand free emails a month its a real steel! Not having to pay a fee just becuase you have over 2000 contacts. Being able to add customer accounts is a fantastic bonus so that they can just login and view their own campaign reports and manage their own lists if need be. The price policy, as well as a great integration with Joomla, are 2 factors which we like the most! I recommended the Elasticmail integration with several customers and offer them the product support. There are at least 2 more customers who use the product because of my recommendation. 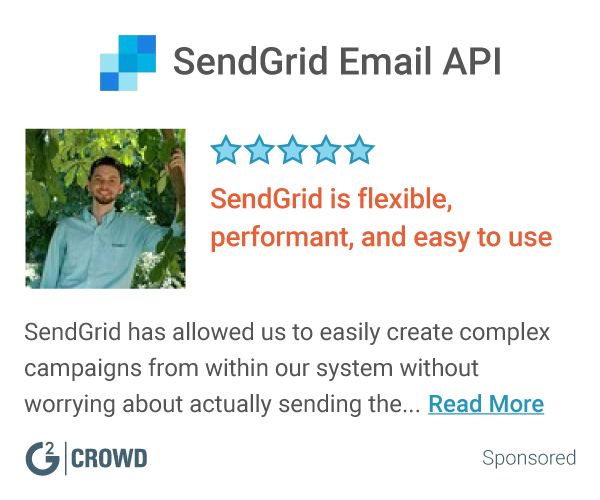 "No nonsense email provider with a few hiccups"
The free package is very generous considering the monthly quota compared to other similar solutions like Mandrill (RIP) and SendGrid, and I've found the deliverability to be excellent. It takes some extra time to set up advanced features like SPF/DIKIM as you have to look for the right parameters in the Documentation, it's not so smooth like when I did it on Mandrill. DKIM tests passed fine, but I've had some trouble validating the SPF record. Compared to Mandrill, I've found one more thing to be lacking at the moment: a detailed send log where I can see every email I've sent during a date interval with statuses (success, soft bounce, hard bounce, etc). Domain / SPF / DKIM setup could use a little UI/UX improvement. I had to search the official documentation to find the values I needed to set up on my DNS server; Mandrill used to instantly show the right information for the account. Also, if would be awesome if bounces could be tracked in detail (eg. a list of sent/soft bounced/hard bounced emails could be downloaded like a log file on Mandrill). Generic marketing/transactional email delivery. For small projects, the free package is an excellent choice and has a larger mail / month limit than the competitors, while setup is only a little bit trickier. "Indispensable, easy to use, and powerful"
As the title says, elastic email has been absolutely indispensable to our business. We help our customers utilize our custom platform for selling their products online and elastic email integrated with Malik has been critical to our ability to give our customers the power to communicate effectively and automatically. The system has incredible features and a lot of capabilities that will help any business large or small. Some of the initial set up was a little complicated but overall pretty easy to use. Once you understand it it works beautifully. Strong product, strong support, easy to use, and does what it's supposed to do. We had to have a reliable powerful and easy to use email platform for our platform that we built for our customers to have a powerful shopping capability for their products. Working in a company that nearly depends on email marketing, we were looking for suitable platform where we can inventively create newsletters, send them and follow the results at the end of the day. Elastic Mail provides all that and much more. It gives clear and easy access to all previously sent campaigns where you are able to sum up and compare the reports and to statistically follow the reactions of your subscribers. Also you can easy manage your subscribers, organize them, edit or add contact. The good part when it comes to creating newsletters is that you can choose whether way suits you more. Depending on what our content is about, sometimes we use "drag and drop thing" and sometimes we are using the templates which are very helpful, innovative and creative. Also the good part is that you can schedule the time when your newsletter is going to be send, so you are able to organize and to plan your newsletters even week ahead. The thing that, according to our experience should be improved is the draft section. Sometimes we are creating the newsletters few days before the sending date and it happens very often that we are not able to save them as drafts only because we forgot to purchase our credit limit. Also the preview of the newsletter on mobile device sometimes do not cooperates with the real appearance after the specific newsletter is received. We warmly recommend Elastic mail, if your are creative, innovative and well organized this is the right platform yuo need. The advantage of using Elastic is that you can always choose different design for the newsletter that you are creating, which is very important for our business. It is important to hold your buyers and clients awake, that way they are always expecting something new and creative which gives opportunity to promote and to advertise your product and services well, which, at the end, is our main purpose. "Good service and fast email and easy to use"
I don't use for bussiness realized. I use for notice for user that i posted a new post. "Why you should use Elastic Email for your email marketing campaign ?" The best thing of Elastic Email: you can sent up to 150,000 emails for a month and maximum 5000 emails for a day. And the cost per 10000 is 0,9$, very good price to go with. I also like the time of support very quickly. Working with many customer and if Elastic Email do not have sub-acc option, my job would be a mess. - How convenience when customer can login to sub-acc and check the result. "Got more leads through ElasticMail"
I can send daily 5000 emails to 5000 subscribers in free plan and if I want to send more mail, I can do that in very cheap rate. I can purchase dedicated IP at a very cheap rate and can use it for sending emails. I can design templates and also Elastic mail gives me breakup of my performance and how to improve tips. Domain / SPF / DKIM setup could use a little UI/UX improvement. I had to search official document for that. It's very cheap and easy to use. I am into web development business and I used ti send emails through MailChimp earlier which is quite expensive, but elastic mail is so cheap and gives so many options so I got benefited very much. I tried in free for the first month and got leads and it didn't cost a single penny, what else anyone wants it for small businesses. "Solid email platform with white label support at a great price"
- Poor api. While it is fully featured, it is not technically a REST api, and the documentation is somewhat lacking. It also has limited language support for API libraries. - Poor communication to customers. Breaking changes are sometimes introduced without notification to the customer. Painful to have to scramble to fix an api implementation when the functionality suddenly breaks due to a change that is introduced. If you want something that is very customisable with plenty of features at a reasonable price, then I'd recommend taking a look. Be prepared for a bit of a learning curve initially, and a bit of pain using their API. If you want something that is a bit more rock solid with a nicer API, there are other options out there, but it will cost more, and there may be some limitations on how customisable they are. White label email marketing solution, utilising API for facilitation. They also white-label their subscriber management and email-builder interfaces, but we have implemented that manually ourselves for a more custom solution. The sub-account support enables us to silo activity for individual customers. Focus on your app and content and let Elastic Email do the hard job! Sending emails is a real joy with EE not a horrible task. 150000 emails a month right in the inbox and yeees it's free!!! Batter than free are the features it has. Beautiful templates and compete reports are those I like more. For someone who moved from another provider, like me, Elastic Email is too good to be true. Sometimes I wake up and check the website for hidden fees! Is it real? Yeah!!! You lose nothing! Test it, Compare it and Stick to it! You won't a cheaper stable service for email marketing. I can't trust my well-configured server for sending bulk and even transactional emails. This is where EE helps me to live happily. Emails knock the door of inboxes and get through. Error logs are way easier than what my server produced and I can track customers and visitors the right way. "Helped a lot with my SaaS project"
It's really easy to configure and works well as a mail engine. The nice thing is that you get automatic saving of recipient email addresses. This way I get my users mailing list without having to manage integration with my db. And this is for free, at least for my level of usage. I liked also the logging/tracing, so I get to know if my users get my notifications/messages. Support was fast and solved a problem I had with configuration. Admin UI is not perfect but getting better. Navigation is sometimes not easy. I use it with my small SaaS project. I use it to manage users mailing list so I don't need to do much to send emails to all my users. Every user email gets automatically saved in elasticemail when I send the "welcome user" email from my site through the elasticemail SMTP service. There's not even a need to call a HTTP API. "I was pleasantly surprised when I found the Elastic Email service available as a Drupal 8 module. " The ability to send so many emails free of charge. The new survey option is great as I was actively seeking a survey module when I was informed of the new one with Elastic Email. There isn't really very much I don't like. I found the setting up of the site a little technically challenging and was offered a couple of conflicting help suggestions by the Elastic Email support team but the issue was finally resolved and now I'm more than happy with the service. 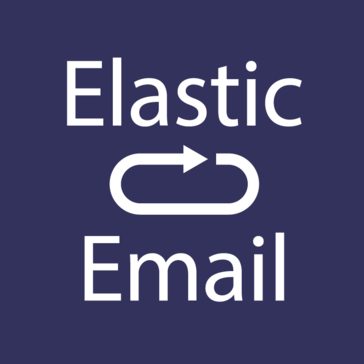 Elastic Email is a valid and venerable option when considering email service providers. I have enjoyed using the service thus far and would recommend it to anyone looking to send out targetted campaigns to multiple subscribers. Targetted email campaigns available in the Drupal 8 administration area. The ability to see who has opened, clicked on and followed links. "Affordable yet powerful Emailing Marketing Platform"
I was looking for a true alternative of Amaozn SES , once we come through it found much powerful and feature rich at the very similar price . It is One of the most affordable Email Marketing solution in the industry. Their recent updates made the platform automation rich . I love too use autorespnder and detailing reporting system . They provide in dept server logs. To be honest , I cloud not see anything wrong with ElasticEmail . A false positive campaign trigger will make you to contact Support team and provide valid documents time to time. If you are looking for an affordable email solution which can provide transactional and promotional mailing for , you can prefer Elastic Email. We are doing email marketing here . We are able to send out emails to our large database, the recent product update made it awesome , now we are able to re-target only most responding subscribers. "Cost effective but some deliverability and setup concerns "
You may need to involve your hosting tech support to get everything set up correctly. If you are getting alot of spam reports or low deliverability ask them to switch you to a different shared ip address. Very affordable and no service problems. Get multiple IPs, it's worth the extra cost to get your mass mailings delivered more quickly. I was looking for an ESP that allows marketing email without charging insane pricing like other ESPs. Elastic Email was the perfect solution for us here at NeverColdCall.com. In addition to great customer service, VERY affordable rates, and the ability to have multiple mail IPs that rDNS to your own domain, it's great all around. Excellent reliable email delivery. If you are using a shared hosting or even a VPS and having trouble with emails going to junk folders, elasticemail's IPs have a great sender reputation. Their support is great and I hesitate to have a dislike but I would like to see a live chat available in addition to their discuss support. The setup of email SMTP service is complicated by nature. Someone with no knowledge of email systems would have a difficult time but if you have done even a little bit of web hosting or email setup, their support can guide you. High volume email delivery was a problem. ElasticEmail helps me deliver over 15,000 emails in a day with very very few delivery problems. "Excellent cost effective product for outbound mail and email marketing"
The price of the service is dramatically cheaper than other email sending solutions such as mailchimp. I know the product does not have as many features as mailchimp etc but it does the basics that you will need. For newsletters it is not as polished and user friendly as mailchimp but if you are an experienced web developer this is not a major issue. Give it a try, it is great value so low risk. I first used the product on a dating site I own. We use it to send email notifications between users. We went for a 3rd party solution so we could deal with large volumes of email. Also the trackability of emails is also great. Then I started using it for newsletter campaigns. It isa fraction of the cost of alternative products like mailchimp. "Elastic mail nơi khởi nguồn kinh doanh"
Tôi thích sự tin cậy từ elastic mail khi mà những tin tôi gửi luôn được vào hộp thư chính của khách hàng.VÀ tôi thích phần báo cáo từ đây tôi có thể biết được có bao nhiêu khách hàng của tôi đã mở mail. Tôi kiểm soát được những thông tin mình gửi sẽ đi về đâu. They have very attractive plans, very useful support material (highly needed for a newbie email marketer like me) and fast and effective support. The first time I had an issue things took a while to get through but things seem to be solidly on track now. Email marketing for small and targeted groups. Its simple process to send or schedule any campaign. it contents everything like list uploading, creating campaign so easy. ah one more thing after sending campaign you can see review everything sending and sent mails. unsubscribe, complaints, open, click, link clicks everything. 5 start out of 5.
we are sending newsletters to our subscribers about digital marketing, web solutions and we are getting positive results. Their friendly support is a must, their service is amazing and the resources they offer is Top Gun! I'm a customer almost for a year and I'm a very happy one! I wish I have discovered them before, it will spare me a lot of time and money! If you are into emailmakrketing or need send a huge ammount of emails I recomment Elastic Email as a first stop! I think it's difficult to dislike anything on their operations, their support is fast and always helpfull! If your translations is not working for you, deal with Elastic and improve it yourself, it will make your life easier! I just help finished to translated their interface to Portuguese and now it's like a brand new product to my customers! Elasticemail is a surprisingly great mass mailing solution for contacting your client base and subscribers. The newsletter builder is very intuitive and easy-to-use. I've lost my newsletter-building progress when started working with the system. Turns out that I just had to restore the previous version. This part isn't intuitive enough. Maybe some tutorial at the start would have helped. Spend some time with the tutorials and you'll get yourself a powerful and affordable mass mailing solution. Contacting the list of our clients with news and offers as well as sending blog post updates to subscribers. "So easy it makes Life smooth"
The ease of use, the many features and ways of creating a template and campaign. The informative reporting area is great. Tracking emails what work and making sure our lists are kept up to date. "Very easy to set up and get started, with reliable service." It is very easy to set up and get started. I was able to set up my account and start sending transactional and marketing emails within 15 minutes. The service has been very reliable so far and their support staff have been able to answer all my inquiries within a reasonable time. The admin UI of Elastic Email can be made a little better and more easier to use. Another thing that could be improved is to provide more information about why an email has bounced. Elastic Email is very easy to set up and use. I suggest learning how to use their sub-accounts feature as it really helps when you want to segment your emails or use different domains. We wanted to make sure that emails sent from our software were sent out without ending up in our users' spam folder. Doing that ourselves was a big and complicated task. Elastic Email helped us focus on making our own product better. * We monitor all Elastic Email reviews to prevent fraudulent reviews and keep review quality high. We do not post reviews by company employees or direct competitors. Validated reviews require the user to submit a screenshot of the product containing their user ID, in order to verify a user is an actual user of the product. Hi there! Are you looking to implement a solution like Elastic?